After spending several days, I figured out how to configure IP address feed on Fortigate firewall. This is one of demanding feature requested by most Fortigate administrators to ease their job. You can also download our free tool – Firewall Feed to easily manage text file of IP address in your local office network. Our tool facilitates adding, removing, counting and bulk addition of IP addresses in a text file. 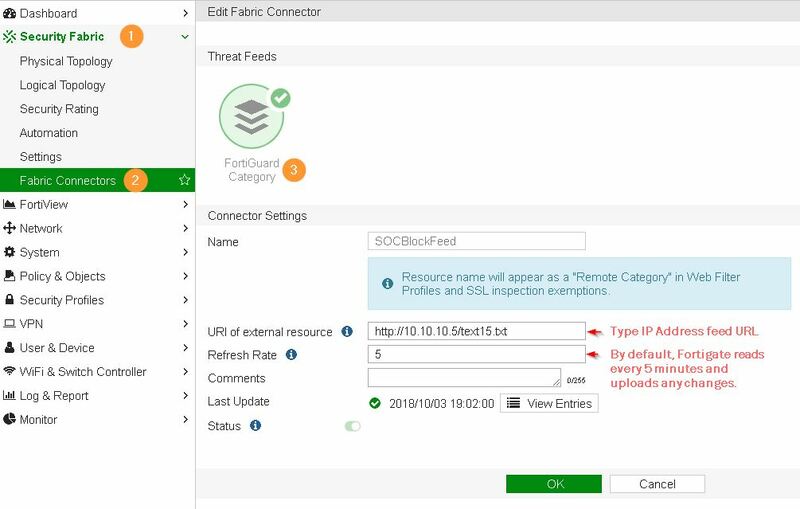 Under Fabric Connectors, right click on recently created Threat Feed “SOCBlockFeed” and choose View Entries to see all the IP address from your text file. Under FortiGuard Category based filter > Choose Remote Categories and set “SOCBlockFeed” to Block. Choose inspection profile that is being used in your environment. Enable above configured Web Filter and enable SSL Inspection. Test your configuration by accessing any of the IP address from the list. You must receive “Web Page Blocked” notice from Fortigate and category mentioned as SOCBlockFeed.